As I mentioned in my post on the book, the Ancient Mariner from The Pearl and the Pumpkin was originally a character from Samuel Taylor Coleridge’s poem The Rime of the Ancient Mariner. In the story, it’s the schoolmaster who recognizes the Mariner, obviously because of his familiarity with the poem. Why the captain’s killing an albatross was such a big deal has to do with nautical superstition. Albatrosses are considered lucky, possibly because sailors once thought sighting one meant they were close to land. 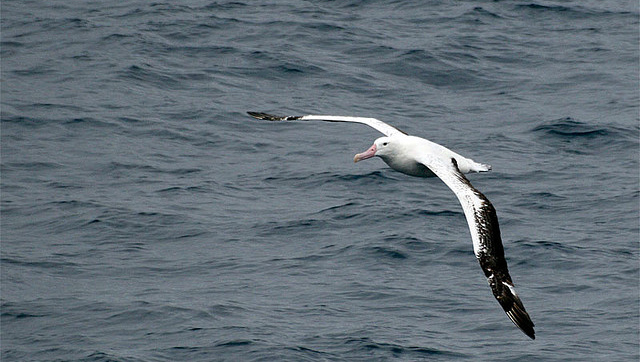 Actually, albatrosses only come to land to mate, so unless it’s mating season it might not be such a great sign. In the poem, following the albatross leads the Mariner and his crew out of the Antarctic, presumably meaning it was a wandering albatross. These birds nest in the Antarctic, but are known to wander as far north as the thirtieth parallel south. Yes, I can regurgitate information found in the Encylopaedia Britannica as well as anyone. Anyway, the Mariner is forced to wear the dead albatross around his neck, and can only discard it when he repents. Even then, he still had to wander the world and tell his story to anyone who would listen. He’s sort of a cross between the Wandering Jew and the Flying Dutchman. To say that someone has an albatross around their neck means they’re living with a burden of guilt, but I really haven’t come across the expression particularly much. The bit of the poem that I do often hear referenced is “Water, water everywhere/Nor any drop to drink,” although it’s usually slightly misquoted. I actually never studied Coleridge in school, so my introduction to him was through Douglas Adams’ book Dirk Gently’s Holistic Detective Agency, which I read while in college. Unlike the Hitchhiker’s Guide to the Galaxy series, I’ve actually only read the two Dirk Gently books once each, and the plots were so convoluted that I’m a little rusty on the details. The first Dirk book uses Coleridge quite heavily, however, making him a fellow of the fictional St Cedd’s College at Cambridge. The real-life Coleridge did attend Cambridge, but at Jesus College. Ancient Mariner figures quite prominently into the plot, as does his short poem Kubla Khan. The story behind this poem is that Coleridge fell asleep on opium after reading a description of Kublai Khan’s summer palace in Samuel Purchas’ Purchas his Pilgrimage, which was in turn based on Marco Polo’s writing. As Wikipedia mentions, it’s unlikely that he actually had a copy of the Purchas book with him, as it was huge and rare and he was apparently recuperating from sickness in a farmhouse at the time. Also, he claims he didn’t exactly remember Purchas’ words, and if he’d had a copy on hand he could have just looked them up. Coleridge might actually have been the first to use the spelling “Xanadu”; Polo called it Ciandu and Purchas Xandu, and apparently the generally accepted spelling nowadays is Shangdu. It was a real place, but it was destroyed by Ming invaders in 1369. Anyway, Coleridge claimed that the complete poem came to him in a dream, but he wasn’t able to finish before being interrupted by a person from Porlock (which was a nearby town, not a cannibalistic mutant in the distant future), and found he’d forgotten most of the rest of it after the conversation was over. Whether there’s any truth to this fanciful account is unknown, but I know all too well the feeling of coming across something interesting in a dream and then forgetting all about it. The thing is, when I DO clearly remember my dreams, they’re often rather fragmented. Sure, they contain occasional cool ideas, but only occasionally do they have consistent narratives. If we could record our dreams, there’s a good chance we’d be somewhat disappointed. So I wouldn’t discount the possibility that Coleridge THOUGHT he dreamed an entire poem, but really hadn’t. 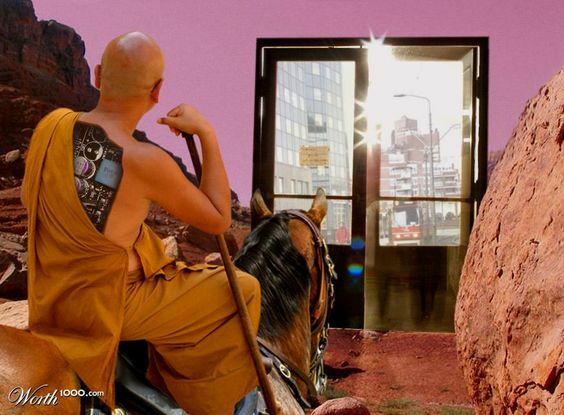 Nonetheless, the last verse of Kubla Khan is basically about how Coleridge has forgotten things marvelous enough to rival the Khan’s palace at Xanadu, which is even more impressive in the poem than in descriptions of the real-life place. It definitely resonates with me in that respect. This page provides a good description of how Coleridge’s two poems figure into the plot of Adams’ book. Basically (if anything about that book can be considered basic), Adams has it that Coleridge originally wrote the poem, with the second part being even weirder than the first. It turns out that the work was dictated to Coleridge by an alien ghost who made a mistake that resulted in his ship crashing, him dying, and life beginning on Earth. The poem contains instructions for repairing the ship, and the ghost eventually gains access to a time machine and goes back to correct his mistake. When the protagonists realize that this will result in Earth becoming totally lifeless, Dirk Gently goes forward in time to interrupt Coleridge before he can finish the poem. So he’s the person from Porlock, although whether he’s actually from Porlock isn’t stated. 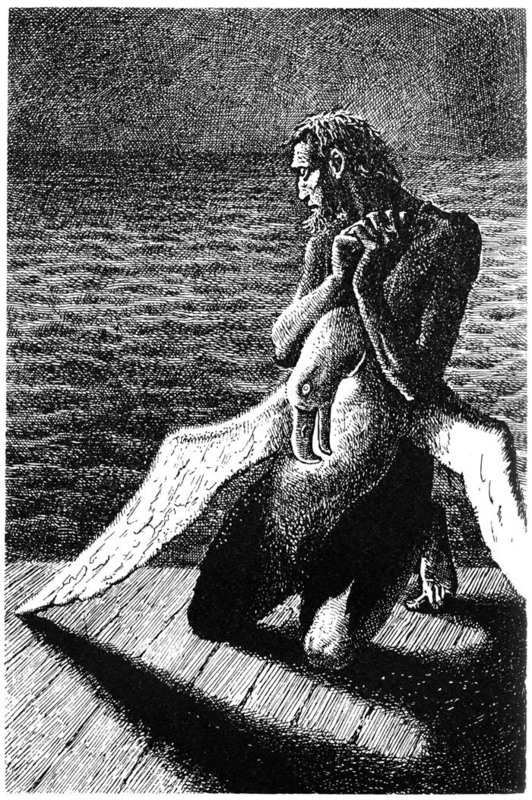 The Ancient Mariner comes into the picture because that’s essentially who the alien ghost is. He makes a mistake that kills himself and his crew, presumably involving an asteroid, and is forced to wander the Earth and witness the evolution of life, which he sees as the “slimy things [that] did crawl with legs upon the slimy sea” mentioned by the Mariner. He also tells his story to a wedding guest, just as the Mariner does. Dirk is the one who inspires Coleridge to include an albatross in an upcoming poem, but this part is a bit confusing. The implication seems to be that Dirk mentions the guy the ghost is possessing murdering someone named Albert Ross, and Coleridge mishears it as “albatross.” Or perhaps it was Dirk who misheard, as he specifically mentions asking about an albatross after distracting Coleridge. But then why would the ghost complain that “the bit about the bird was all nonsense” BEFORE the timeline changed? Apparently Coleridge originally wanted to use an asteroid in the poem, which presumably reflected the ghost’s story more accurately. So is it a closed loop, or was there originally a different bird altogether in the poem? This IS around the part in the book where there’s a lot of discussion of the dodo. Besides, the albatross in the poem makes sense to me. Also, Coleridge wrote Kubla Khan in 1797, and the word “asteroid” wasn’t coined until 1802. Then again, we only hear about the conversation with the poet from Dirk after the fact; maybe Coleridge actually said “falling star” or something of the sort. Perhaps the more important question, however, is one I’ve seen on several pages through a Google search, which is why the ghost needed to dictate the repair instructions through a poem in the first place. He does explain that his level of control and consciousness ebbs and flows, so maybe he needed the mind he possessed to know the instructions in case he wasn’t able to take control after the trip back in time. I’m sure I could at least get an Electric Monk to believe it. It’s just too bad we can no longer ask Adams himself. By the way, I recommend the comic Lit Brick, which most recently dealt with Coleridge. There’s also a fair amount of Oz content. This entry was posted in Animals, Authors, Dirk Gently, Douglas Adams, Dreams, Poetry and tagged albatrosses, albert ross, ancient mariner, dirk gently's holistic detective agency, flying dutchman, kubla khan, Kublai Khan, lit brick, marco polo, samuel purchas, samuel taylor coleridge, the pearl and the pumpkin, the rime of the ancient mariner, wandering jew, xanadu. Bookmark the permalink. The alien spaceship plot was borrowed by Adams from one of his “Doctor Who” serials, not the only time he did that. I’d heard that about both that book and Life, the Universe, and Everything. Was the Coleridge part in a Doctor Who script, though, or was that added for the book? I don’t recall any other Coleridge connection. The other big one was the one involving a space prison, which was based on “Shada”, a “Who” story that ended up being only half-filmed because of a technicians strike (though both the half-made film and an animated version have been shown since).